Decanting can seem a mystery to many. It is one of the issues that has presented itself here in previous posts and that I think people are curious about in genera. Should you or shouldn’t you? Is it necessary or even beneficial? Our wine expert Terry Rogers is here to demystify the art of decanting and help you decide whether or not your wine should take the plunge. Who actually owns a decanter nowadays? People who live in stately homes, or perhaps the proprietors of antique and curiosity shops? No, not at all. Anyone who wants the best from their wine should own one. Decanting wines is not just for show, and even in this modern age of industrial, fined and filtered wines, some will still benefit from spending some time in a decanter or a larger receptacle other than the bottle itself. So how exactly do you go about properly decanting a wine? If decanting a wine simply to aerate it and perhaps liven it up a little, simply pour the wine into any suitable receptacle with minimal fuss. 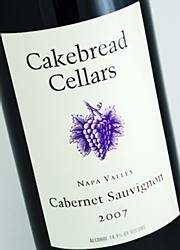 By this I mean a young wine that you have just purchased for a dinner that evening; such as a Cakebread Cabernet Sauvignon 2007 ($65). This wine truly needs to just find itself into a decanter with a large area for breathing or even a water pitcher. The wine is young, will not mature and will continue to get better in the receptacle and your glass for hours. Now if we are decanting a wine in order to remove it from its sediment, there is a simple procedure to follow. First, take the wine from where it has been stored, hopefully lying on its side in a suitably cool, dark environment. If you suspect a considerable amount of sediment, as may occur with older wines, it’s advisable to stand the bottle upright for a day or so prior to decanting, thus allowing the sediment to fall to the bottom of the bottle. When the time comes to decant the wine, assemble the few things which you will need. First is the corkscrew. If the wine is very old you need to use what is called an ah-so corkscrew – a two pronged object that fits on each side of the bottle neck that is between the cork and the bottle neck. With the ah-so you will not puncture the cork for if the wine is old the cork with be dry and can crumble with a regular waiter style corkscrew. The Ah-so will pull out the whole cork gently. 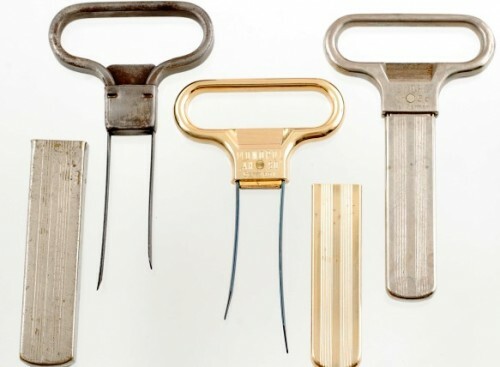 This type of corkscrew has been the wine lover’s friend forever as evidenced by these vintage examples. 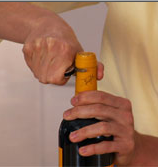 Firstly, remove the entire capsule from around the neck of the bottle, using a knife or other implement. It’s important to remove the whole capsule, and not just the top, as you need to have a clear view into the neck of the bottle whilst decanting. This is so you can observe the wine coming through the neck for sediment. To enhance your view of the wine in the neck, position a light source so that it shines through the neck from behind. Once done, you are ready to pour. Hold the receptacle in one hand and the bottle in the other, and with a smooth and steady action, pour the wine into the decanter. 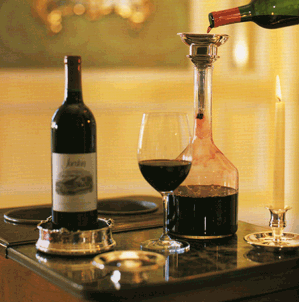 Don’t rush when decanting, rather use a gentle, steady movement, to avoid disturbing the sediment in the wine. Keep the neck of the bottle over the light source, so that you can observe for an arrowhead of sediment moving into the neck of the bottle. This is your cue to stop pouring. I am a fan of decanting young wines whether they are white or red. Every evening when my husband and I are at home and I am cooking fish, veal, steak, etc., I always go to our fine cellar to see what wine is going to work with the meal. 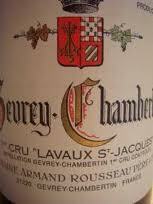 If we are going to have a Burgundy such as an Armand Rousseau 2003 Gevrey Chambertin Lavaux St. Jacques, I know that this producer truly needs some breathing time from its heritage especially since it has been sleeping in my cellar. Therefore, I will automatically gently open the wine and pour it into a decanter. I have a magnum decanter at home that I like to use since it gives the wine even more air time even though what I am pouring is only a 750ml regular size bottle. If you don’t have a decanter feel free to use a clean flower vase or water pitcher. If you go to many of the restaurants in the hills of Italy you won’t be getting some fine decanter – you will be getting the water pitcher!!! The reason for bottling wine is to stop the fermentation process. So when the winemaker is tasting through the barrels he or she has to decide when to take the wine from the barrel and put it into the bottle. The bottling process takes the molecules down from 300 molecules to 3 molecules and the wine then is ready to go to sleep in your cellar. This is why the decanting process can be important especially for young wines. If you are dealing with a wine that has been kept in a very good cellar such as a wonderful Bordeaux from the mid 1950’s (i.e. : 1953 or 1955 – great years) and it is a fabulous first growth Bordeaux such as Ch. Lafite Rothschild, or Ch. Margaux the wine needs gentle airing. NO decanting. Just open the bottle with the ah-so as mentioned above and gently pour this beautiful old wine into the special Bordeaux glasses you have chosen for the evening. As you know, glasses are as important for the whole experience. 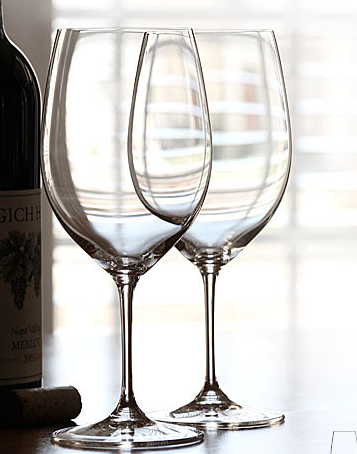 The Riedel glassware is a perfect example of a beautiful way to express the wines. I like to use the Riedel Vinum Bordeaux for not only young red wine but also white wine!! Yes, white wine also needs time to enter this world to give us some pleasure. 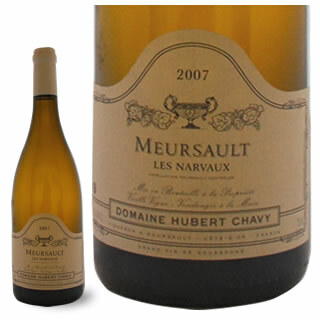 Now I am not talking about the $10 bottle; but let’s say you want to take a plunge into a beautiful Burgundy such as a Chavy Meursault “Narvaux” 2008 (100% chardonnay – $65). (I know, photo shows the 2007 vintage). This vintage is young and needs some air to show its true flavors. Never feel bad about putting a young wine in a decanter of some large glassware or that water pitcher. Think of wine as a genie in a bottle. It is a mystery; each bottle is different and you never know what that genie will end up giving to you. 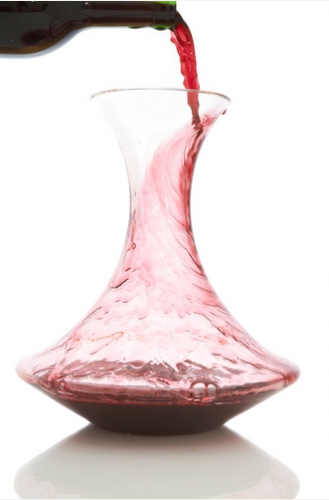 For a young red wine you can give the wine approximately 45 minutes to sit in the decanter before serving your guests. It would also be a good idea with the wonderful white burgundy to take it out of the refrigerator one-half hour and decant before serving to the guests or just you and your romantic partner. You’ll be happy you did. Thanks Terry! If you decide to up the ante and start decanting your wines, there are many beautiful containers to choose from or even collect. 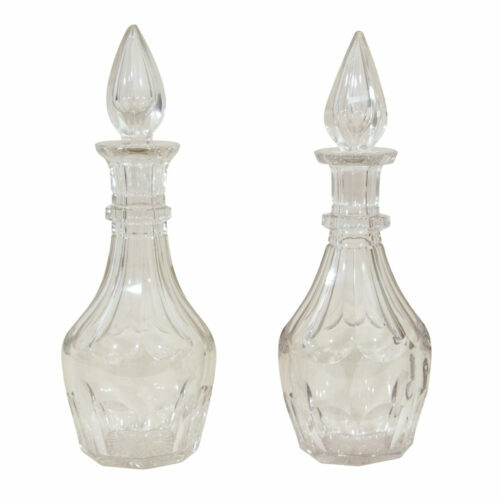 Take for example this pair of English cut glass decanters from the mid 19th Century. 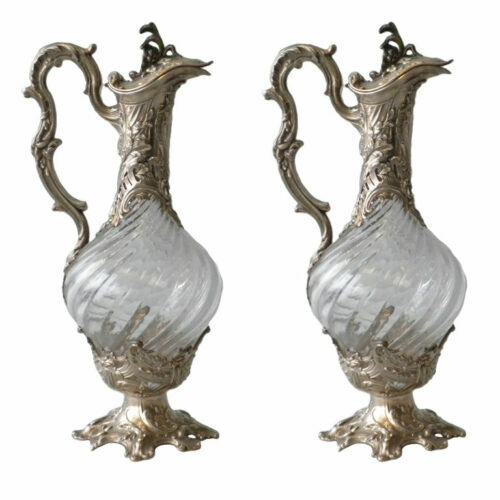 or you can go all out with these French silver and crystal decanters, circa 1900 made by the Paris silversmithing firm of V. Bolvin. But whatever you choose, remember to follow Terry’s advice and no matter what you serve your wine out of, it will surely be tasting better! This entry posted in wine. Entry Tags: Riedel Vinum Bordeaux, Wiliam Yeoward Ariadne Magnum Decanter Bookmark the permalink. Wonderful. I am still learning more and more about wine… my mother always has a few decanters and lovely things for her wine collection, but really appreciate some great information on using them. 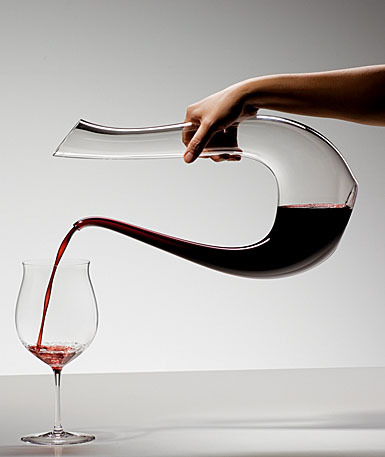 I love the design of the Amadeo Lyra decanter, above, most especially. Thank you, Terry, for all of the sound advice! My questioned answered in a wonderfully descriptive and informative post – thank you, Q! I didn’t realize that I needed to stand my bottles up a day if I suspect sediment and my guests will be relieved I did. 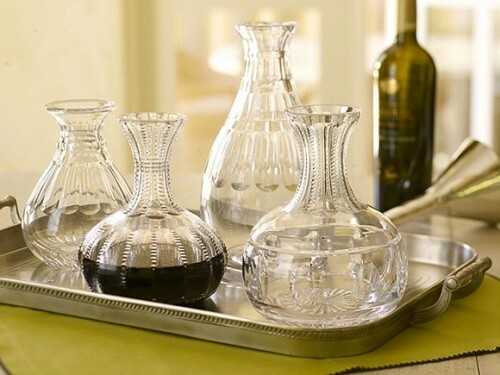 Thank you for the helpful post and beautiful examples of decanters! I had no idea that I could stand my bottles up because of sediment. I just keep learning more and more from your posts, thank you! What a wonderfully informative article. I was thinking of looking for an antique decanter as a gift for my husband. 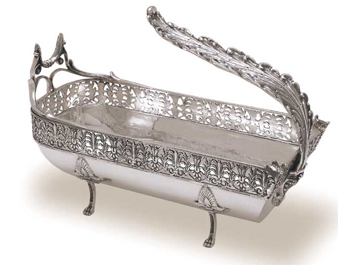 I have a few antique shows lined for for spring and this would be a fun item to search for. He loves trying various wines, collecting bottle openers, etc. Thanks for the inspiration! Very informative information. 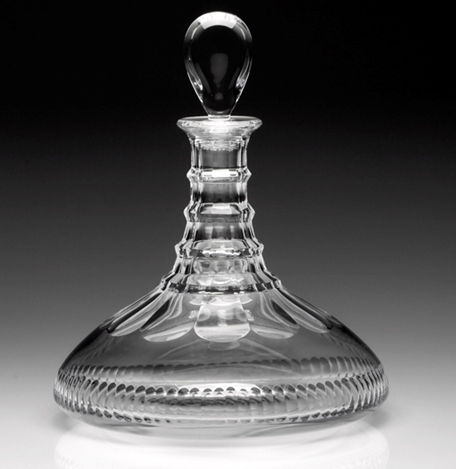 We do have a beautiful decanter that we don’t currently use, however, after reading your post…we will begin to. Thanks so much for dropping by my blog. You will see me again here! Wow! You sure know your stuff!! I love the look of decanters. They look so smart and sophisticated sitting on the side. The ones you’ve featured here are fantastic! The Riedel Aniversary Decanter is so cool! Gorgeous lines. I have given you an award, so come and see. Ps: I am hosting a beautiful Garnish party supplies GIVEAWAY today :) …Just in time for Valentine’s Day! I just forwarded this to my husband who will love all the advice presented. What a great post… Thank you. Thank you for this piece! Very helpful and interesting. We hear so many different needs and methods, it is nice t get a full tutorial. Thank you for sharing. Here’s to you! Those vintage decanters are really cool. 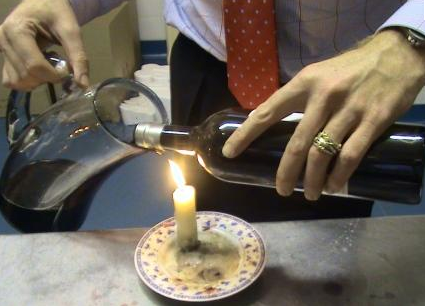 I usually go about it via the decanter & candle method, although members have told me that they have used coffee filters or cheese cloths, which seem to do the trick as well. Really good piece of writing, I am viewing back again on a regular looking for improvements. Great article – much appreciated. On my website you will see many antique decanters (magnums a speciality), but also there are coasters to put the decanters on, silver funnels, corkscrews – and so much more! Everything is guaranteed to be as described (and it is fully), and we send all over the world. More to the point, we specialise in practical antiques which do the job they were designed for. Do take a look! Thanks again. Robin.